Few things say Hawaii like a luau. 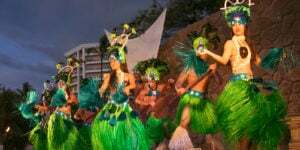 These ultra-entertaining feasts have their roots in ancient Polynesia, when the second king of the united Hawaiian Islands lifted the kapu that banned men and women from eating together—and royalty from dining with common subjects. One of the many boons of visiting Maui is that your choices for fun aren’t limited solely to land: Maui County includes two gorgeous islands that are accessible by ferry, its outer islet of Molokini supplies some of the best Maui snorkeling, and its 120 miles of coastline offer ample opportunities for splashing in the water. For one of the most isolated islands on the planet, Maui certainly isn’t at a loss for activities: from horseback riding across lava terrain to diving deep under the Pacific on a submarine, the Valley Isle positively brims with possibilities. One of the best and easiest ways to delight a lover of Maui is to get them a gift certificate for something fun. Below we’ve listed some awesome gift certificates that will save you shopping time! Flip through a travel mag, gab with a Maui resident, or ogle images of Hawaii on Instagram—chances are your vision will be arrested by the Valley Isle’s Seven Sacred Pools, a wonder of nature on Maui’s east coast that features a gorgeous set of tiered waterfalls. But as stunning and powerful as the inaccurately-nicknamed Seven Sacred Pools (‘Ohe’o Gulch) might be, the Kipahulu hot spot doesn’t have the monopoly on Maui’s hallowed places. Indeed, beyond the postcard-perfection of the island’s beaches, Maui is home to a number of exquisite sites that have long been deeply revered.